La Cocina is a small beach in the stunning La Graciosa island, at the foot of Montaña Amarilla, a volcano that emerges from the sea. Calm is the word that can best define it. There is a ferry that connects daily Orzola, a harbour in the north coast of Lanzarote island, with Caleta de Sebo, the main village in La Graciosa (there is only another one). It takes only 20 minutes to cross the strait between the two islands. La Cocina is in the southwest of La Graciosa. From Caleta de Sebo, you must follow the path that goes along the south coast, on foot (it takes 1 hour), by bike (you can rent one there), or taking one of the few 4WD taxis in the island. Is a long walk, but it worths the time. It occupies a little bay closed on one side by the imposing Montaña Amarilla, which protects the beach from the waves and the wind. This can be a disadvantage on hot days. You'll never find many people here, but since it is so small, you can't have the same feeling of solitude you can experiment in other beaches of La Graciosa. Nothing at all. Take with you from the village everything you need. Not exactly the most nudist-friendly beach in La Graciosa. Small and without rocks that provide some privacy, only suitable for those who don't mind sharing the beach with textiles. It takes much time to get there. 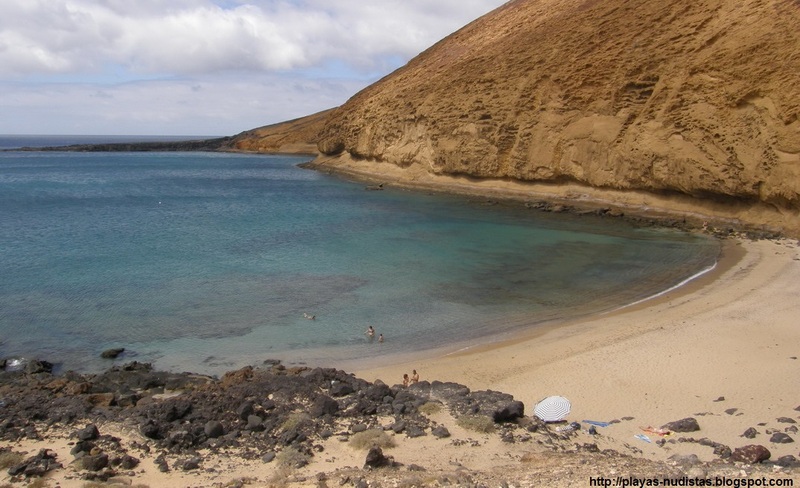 If you plan to visit La Graciosa only for one day, you barely have time to enjoy this beach.